September 27, 2010. Biratnagar. 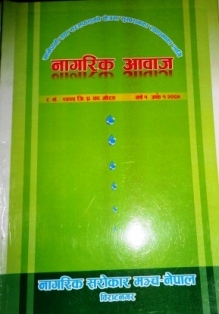 Nagarik Sarokar Manch Nepal Biratnagar, a citizen forum in a way of ensuring safe drinking water and sanitation through good governance has published a book today. Nagarik Aawaz, comprising of articles on safe drinking water, sanitation, proper disposal of waste and the roles/ responsibilities of stakeholders are highlighted in the book. In a ceremony organized at Nepal Patrakar Mahasangh, Nawaraj Subba, DPHO and Chandeshor Shah, chief of District Water Supply Office have jointly released the book “Nagarik Aawaz” in Biratnagar. A concept paper “Role of media in WASH and good governance” was presented by Narawan Wasti in the program. Journalists involved in interaction by raising different issues. In the beginning, Professor Dilli Prasai from Tribhuvan University welcomed all journalists and invitees.